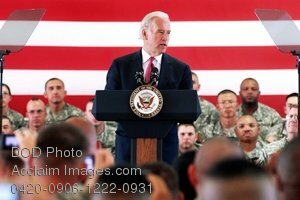 Description: Vice President Joe Biden addresses troops during his visit to Camp Bondsteel, Kosovo, May 21, 2009. During his three-day visit to Kosovo, Biden also met with the president and prime minister and addressed the Kosovo Assembly to assure the officials of America?s support of Kosovo retaining its independence from Serbia. (DoD photo by Spc. Darriel Swatts, U.S. Army). Stock photography by Department of Defense Public Domain.